Preheat oven to 375. Line a 15x10 inch jelly roll pan with aluminum foil. Spray with nonstick cooking spray. Arrange saltines in an even layer on foil. Set aside. In a medium size sauce pan, combine butter and sugar. Bring to boil over medium heat and boil for 2 minutes. Remove from heat and stir in condensed milk until mixture is well blended. Pour over crackers and bake for 10 minutes. Remove from oven and sprinkle white chocolate over toffee. Let chocolate sit for 2 minutes then spread with an offset spatula until chocolate covers the toffee. 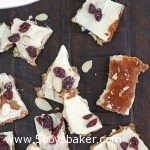 Sprinkle with almonds and cranberries. Let cool completely before breaking into pieces. Store in an airtight container. Toffee will stay good for about 5 days.